Well the Fair has come and gone and now the work of harvest management begins in earnest. 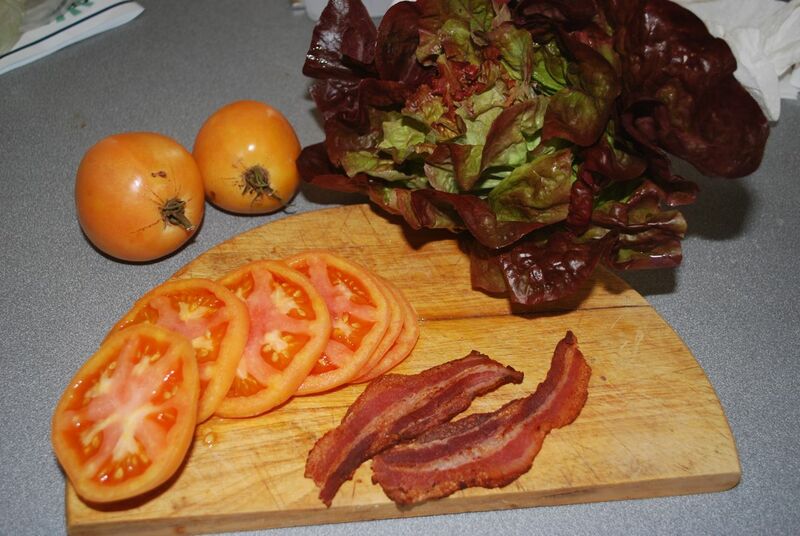 I was very pleased to take a first place in heirloom tomatoes this year with the Italian Sweets I grew from seed. I made the first Tomato Tart of the season, and this morning I will run 10 pounds of cooked tomatoes through the food mill for canning later today as tomato juice. There is nothing quite so wonderful as a glass of tomato juice in the dead of winter to keep hope alive. I am roasting tomatoes every chance I get and keeping them in mason jars in the fridge. 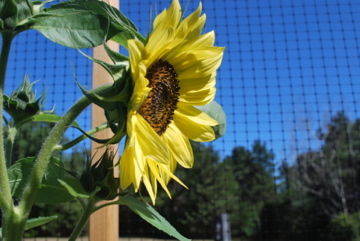 Oh, and thanks to Annie for giving me her orphaned sunflowers. What a treat in the garden they are. 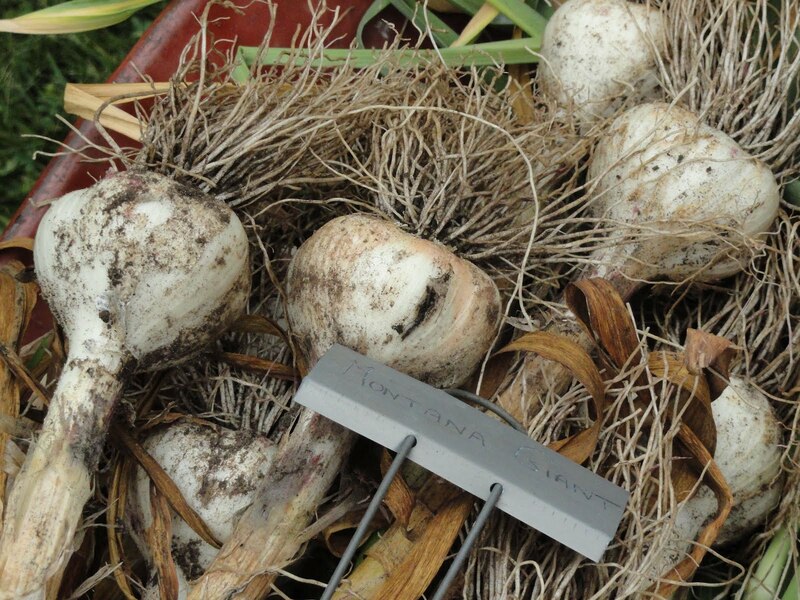 The garlic harvest has begun. This year I have decided to put the drying screen under the oak tree near the beds and "pre-dry" them for a few days before taking them to the cellar where the humidity is well below 60%. We are running dehumidifiers full time because we have clothes down there now. and laid it out to dry in the shade. They look well formed and in tact despite the fact that there is brown in all the leaves. These pictured here are Montana Giant and George. I like this staged method of harvest and storage. Back in February, about the time I was planting artichoke seeds, I started some celery seed. Celery is new for me, and I wanted to see if fresh was worth the work. I use celery in the kitchen all the time. Lately the store bought has been showing its road weariness. 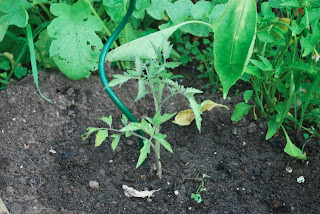 Well the seed DID come up, so in April I planted some more and transplanted them into the garden in May. I now have about 36 celery plants in the garden. I started them below the level of the lip of my raised beds in a modified trench and have hilled them up with soil as they have become even with the bed. Then last week I used newspaper to tie up the February stalks as a way of blanching them. This is all new territory for me. I have read that old timers used to dig narrow trenches in the fall, put in a layer of sand and then lower the pulled celery plants into the narrow trenches side by side. 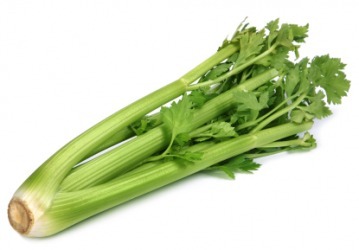 The celery would root cellar happily below ground during the winter months and be plucked from its subterranean vault as needed through the winter. I grow a variety of zucchini called Raven. It produces a dark 7"-8" compact fruit. But this year I have a problem. Bad sexual timing. The zucchini produces both male and female flowers. The female flower has an immature fruit on its base and needs to be pollinated by the male pollen in order to grow into a robust fruit. I have four plants in the garden and for some reason, the male flowers are all coming out on one day and the female flowers on the next leaving me with these immature nubbins. I have never had this problem before, really. And where in the past I would have more male to female flowers, this year it is more female to male. Before the bees came, I had a few good timing days, but it meant I was out there playing Gregor Mendel every morning. Isn't zucchini the crop you can turn your back on and not worry about? What is with this sexual dysfunction? 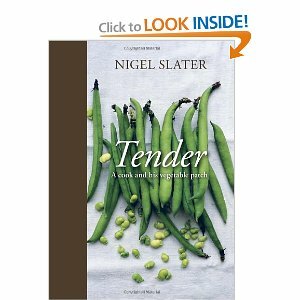 I think it was Nigel Slater's vegetable tome entitled Tender that interested me in growing fava beans. Last year I took an initial stab at the crop , but this year I put in 16 seeds in a 4x4 row. The plants have been vigorous and they blossomed during a nice dry spell. In all regards I would say this was a successful planting with good yield ... BUT ... after shelling two pounds of favas ... the double shelling that is necessary ... I ended up with what could not have been more than six ounces of beans. Now mind you this is well over half of my crop. SIX OUNCES ??? But I was able to create a lovely antipasto to take to a friend's Italian dinner last night. It was perfect for a warm summer evening. Shell the favas and add to lightly salted boiling water. Reduce the heat so they bubble along 2-4 minutes. I would err on the short side here if they are right out of the garden. Maybe only 2 minutes. Drain and cool under running water. Pop the beans from their skins. Add a pinch of salt to the sherry vinegar and stir until dissolved. Whisk in the tiny amount of Dijon (don't be tempted to add more). Whisk in the olive oil with a fork and add the minced parsley and add a few grinds of pepper. Toss in the beans and set aside for at least 20 minutes before serving. Loosely lay out the ham .... scatter the beans on top and serve. Everything but the Rutgers and Hillbilly I grew from seed. I chose the Cosmonaut Voklov because Lynne Rossetto Kasper had it at the top of her taste list for 2011. Pink Ponderosa was a result of catalogue lure probably due to potential size. I needed a backup in case my Big Zacs failed to come through. Soldacki returns this year after making a splendid debut in my garden the last few summers. It comes close in flavor to the Italian Sweet which is by my reckoning the best tomato I have ever tasted. 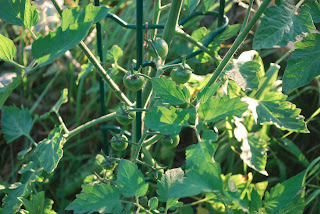 The Sungolds, to my palate, remain the best tasting cherry tomato and the Better Boys are there because after all the blossom drop, blossom end rot and blight the heirlooms are prone to, the Better Boy will insure that SOME tomatoes will make it into the house. In recent years I have adopted the practice of saving plants for fall harvest. 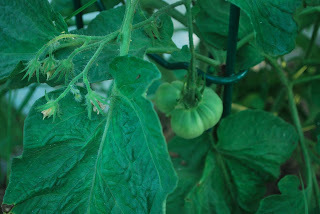 I let the first fruit set, then until about the middle of July, I remove all subsequent blossoms from the plant. Then I let fruiting resume. The result is that these plants are able to withstand the assaults of August and produce solidly up until frost. I might do this with 3 of my 30 plants. This year I tried to keep up with the practice of removing all leaves below the first fruit. It reduces the spread of disease on the leaves. The problem is I NOTICE this in the morning when the plants are wet, and I have learned not to touch a wet tomato plant. So I must return in the evening to do my pruning. I decided the best way to re-enter the habit of regular posting was to start with a picture. Here is a picture of the new deer fence. I must admit I was pretty discouraged about gardening after last summer's tomato loss to deer. But the new fence has lifted my spirits and sent me back into the arena. I kept the old split rail vertical posts and used those to attach the new 4x4s. 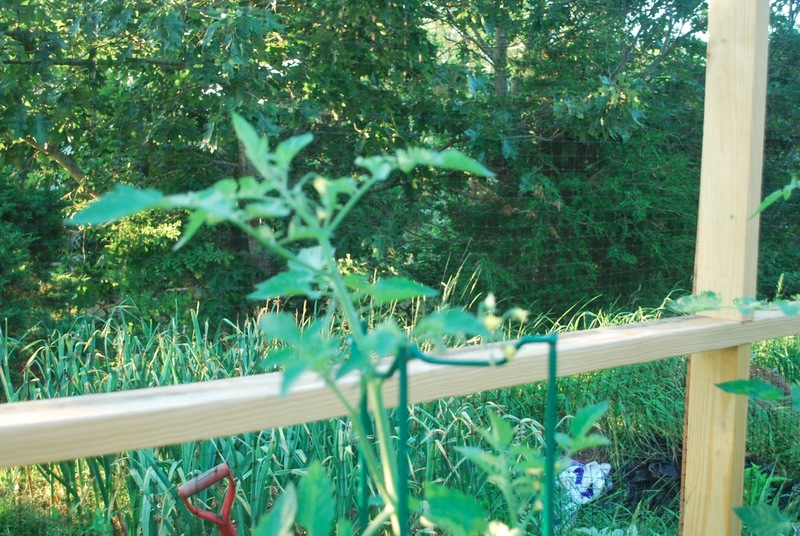 I also kept the chicken wire that ran along the lower rail and reattached it to the new bottom horizontals. So sorry to the rabbits, the deer and the turkeys, but this is MY garden now. The garlic scapes are all picked and I harvested the Uzbek Turbans yesterday. For those of you like me with more garlic scapes than you know what to do with, you might find this new list of recipes helpful. I will be posting regularly now, so stay tuned. Well, well, well. Missing in Action indeed. 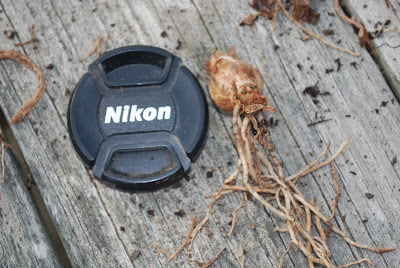 Just a note to say I AM still alive and I have not given up either on gardening OR on blogging about it. Our home in DC is sold. We are living here full time now. And today with the wind blowing hard enough to shut down the ferries for a second day, we are truly living on an island. My fence arrangement which has worked for me for almost a decade, was not sufficient to keep out the deer this year. And once they got into the habit of night time visitation, there was no stopping them from marauding through the tomato and green bean crop with a vengeance. I tried holding them off with a makeshift raising of the fence. I hoped to deter them from nibbling green beans to the ground with help from my local postman. But each morning brought new heartache. So I decided to give this year up for lost and commit myself anew to next season. I was lucky that several new VERY local farm stands sprang up this summer to supplement my meager harvest. When I say VERY local I mean that within a half mile bike ride I can get locally grown salad greens, kale, green beans, eggs, yogurt, raw milk, raspberries, heirloom tomatoes and honey. In addition, within that same radius I can purchase locally raised beef, poultry and pork. And I pass everyday the turkey I will eat for Thanksgiving. 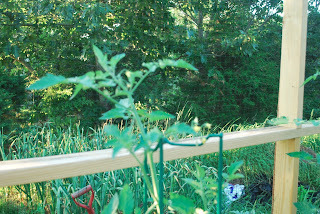 I have been busy putting the garden to bed and thinking about the fence I will put in for deer deterrence next spring. I have read rhapsodic blog entries about fava beans over the years. This might not be the best year for me to experiment with a new crop, but I figured the nitrogen value alone would make the experiment worth it. So when I returned to two rows of bulging pods and fallen plants, I dutifully took them from the vine and brought them in to try them. 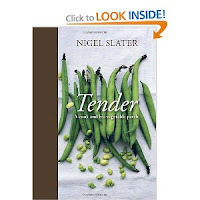 I was guided in my culinary questions by Nigel Slater in his book, Tender: A cook and his vegetable patch. Slater devotes a chapter to the mystery bean. I settled into the rocker on the back deck and eagerly read about stunning flowers (which I missed) and autumn plantings (which I assumed was a UK anomaly). I decided that my beans were past the "cook them in their pods" stage, so I opted for a shelled bean recipe. I had about a pound of pods. A good pod yielded three beans. But wait ... the uncovering continues. You have to now peel the outer shell off of the bean. Boiling salted water for 5 minutes followed by an ice bath. Now the beans are both tender and easily removed from their jackets. In the end I had about 4 ounces of edible bean. Hmmmm. But Slater proposed this lovely pairing of the beans in a sherry vinegar vinaigrette on thin slices of Spanish ham. Prosciutto would have to do with a side offering of cheddar and fresh feta it made a perfect lunch. So having relied on Slater's Fava Bean chapter, I turned now to the chapter on Celery. You have to love a Table of Contents that reads like a seed catalog. I knew celery was challenging so I was hoping to enjoy special tips on how to have a successful crop. Once again, iced tea in hand, I settled into my outdoor perch and opened to CELERY. Under the heading celery in the garden I read. 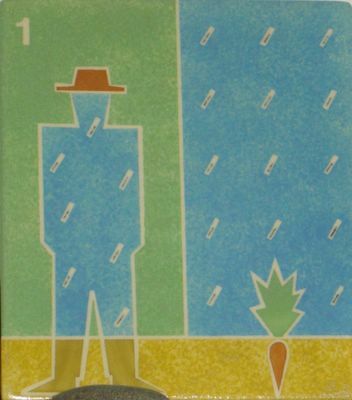 "I have never grown celery, and what is more I probably never will. 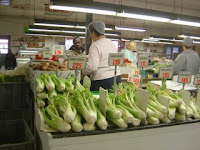 Celery is a crop only for the most committed of gardeners." I was crestfallen. Not that I have a prayer of getting a crop in THIS year, but I was hoping for some measure of encouragement. I ate fresh celery once. 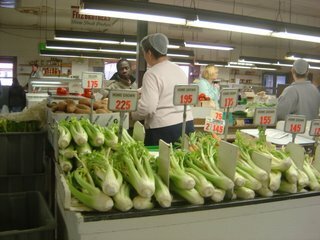 It was at a Farmer's Market in Pennsylvania and the experience was like eating a new vegetable for the first time. It was sweet, crisp and bursting with flavor. I think it was Eleanor Roosevelt who said "You must do the thing you think you cannot do." I returned to the garden on Thursday evening to find that good friends had tended faithfully to the watering chores and saved me from this very dry late spring and early summer. I am deeply grateful for what they did. I had made an executive decision to stop watering the garlic beds after the scapes had come and gone. 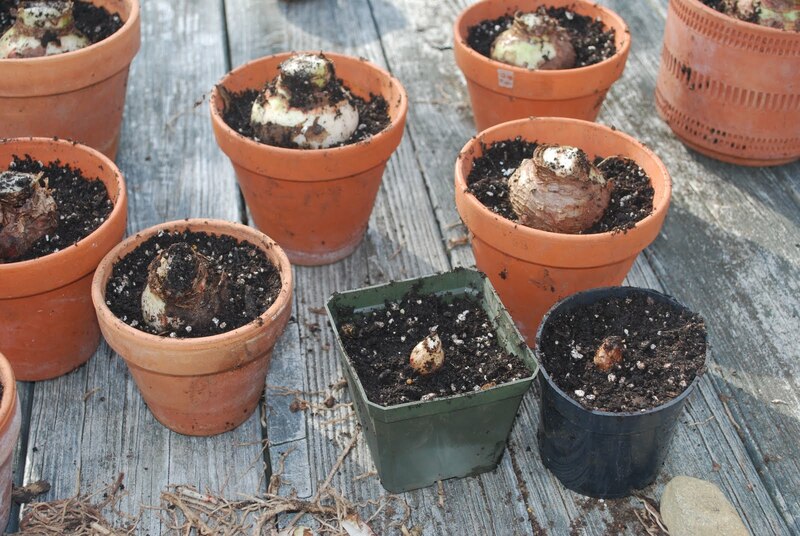 All the literature says to avoid watering after then to keep bulbs from splitting. But normally I would harvest the garlic when the bottom 4-6 leaves had turned brown. Given the early season, that date might have been July 1. This crop was brown as toast from top to bottom when I returned, and I worried if maybe I had made a mistake. Only 3 head out of 200 harvested had this problem. The truth is the bulbs were bigger than ever. They had actually been curing underground in the dry soil and what ever moisture they might have needed, was provided by their very deep roots. It is an EXCELLENT crop. So if there is a lesson here it is that you CAN leave garlic in the ground longer than I thought, and as long as Mother Nature does not interfere with soaking rains, there is little risk to your crop. This is a different season ... a different spring. I will not return to the garden until mid-July. I have 21 tomatoes. 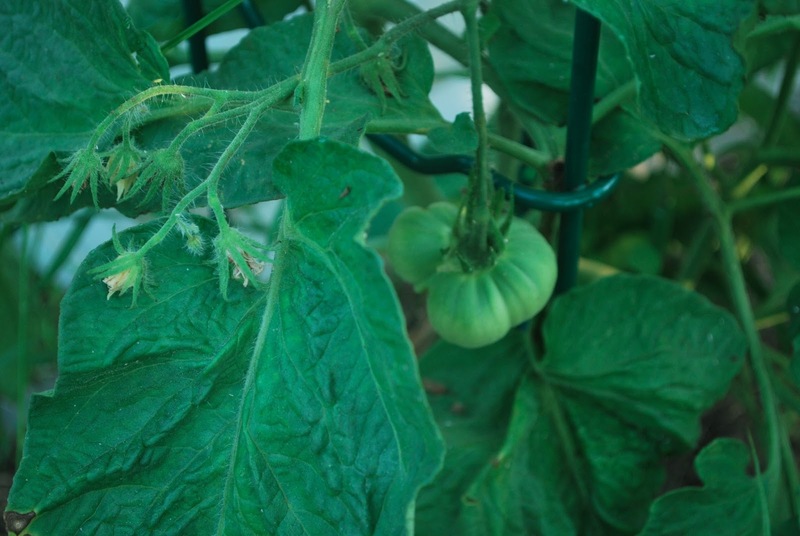 Cucumbers, shallots, fava beans, pole beans and bush beans, melons are in . Garlic is scaping. And most surprisingly, I have already eaten 3 artichokes. 7 artichokes overwintered successfully. I am planting a salad mix called Ovation from Johnny's Seeds in my salad box. It is tasty. I am hopeful that there will be enough regular rain to keep the garden thriving, but I am also very grateful to dear friends who are tending things in my absence. 1. Bring a pot of salted water to a boil. Drop in the asparagus and cook 1 minute until tender-crisp. 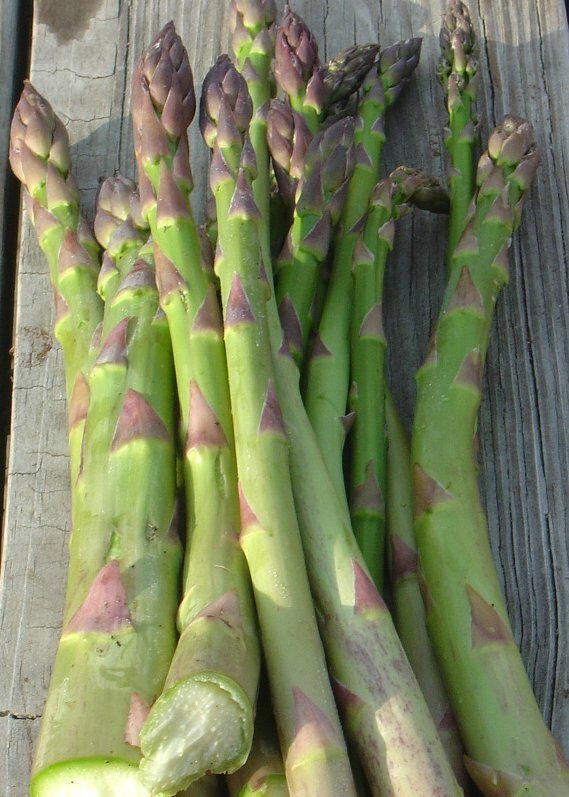 Remove the asparagus with a slotted spoon and plunge into a bowl of ice water. 2. Bring the water back to a boil, drop in the fettuccine, and cook for 8 to 10 minutes or until tender. Drain the pasta, reserving 1/2 cup of the cooking liquid. 3. Meanwhile, in a large nonstick skillet over high heat, heat 1 tablespoon of the olive oil. Add the shrimp, garlic, salt, and pepper, and cook for 1 minute. Add the asparagus and cook 2 minutes or until the shrimp are cooked through and the asparagus is warmed. 4. Return the pasta to the pot and toss it with half of the Parmesan, half of the parsley, the lemon rind, remaining olive oil, and reserved cooking liquid. Season with salt and a generous sprinkling of pepper. 5. Divide the pasta among 6 warm bowls. Arrange the shrimp and asparagus on top and sprinkle with the remaining Parmesan cheese and parsley. Adapted from "Fast & Fit." Around 3:30 each afternoon I start to think about what will go on the plate for dinner. There is something very satisfying about being able to wander into the garden at this time of year and solve that problem. I hate to let a month go without at least ONE post. I have little gardening news to report. The garlic has stored well and I am still have a healthy supply. And there are still carrots and leeks and parsnips to harvest. I am thinking about a new "challenge crop" this year ... celery. 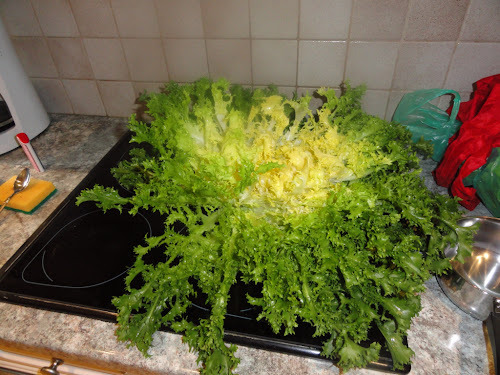 I use LOTS of celery in my cooking. I know that fresh grown celery tastes SO much better than the industrially produced variety, but the work required is daunting. Anyone in Zone 7 or lower have a celery variety suggestion? I took a look out the window at this morning's snowy landscape and decided I needed to leaven it with a touch of August memories. I rooted around in the basement and found one of my jars of tomato juice and brought it up for breakfast. Real tomato flavor is a celebration for the taste buds. I rolled it all around my tongue before taking the first swallow ... I was transported. 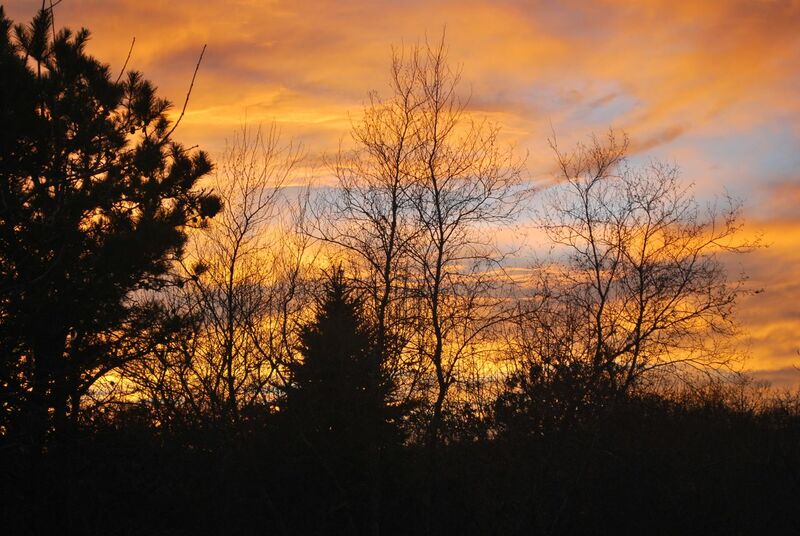 Here's to a taste of sunshine on a snowy morning. 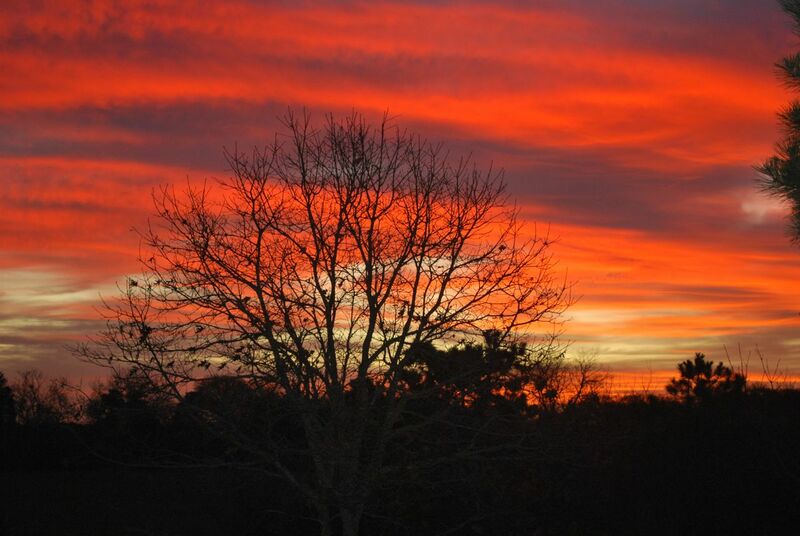 The days are getting so short that pictures of both sunrise and sunset are not hard to come by. Yesterday was particularly stunning with soft clouds refracting pink in all directions. One would think that these hardy rutabagas would keep longer than a tomato, but such is not the case. 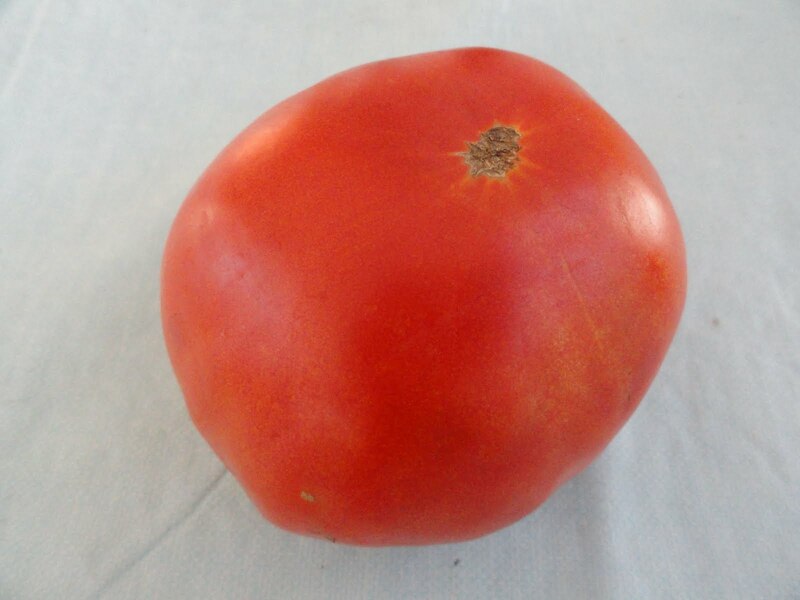 I used my last Longkeeper Tomato to make an end of season (out of season?) BLT. Its orange color is not so inviting, but the flavor is better than anything found in a supermarket. 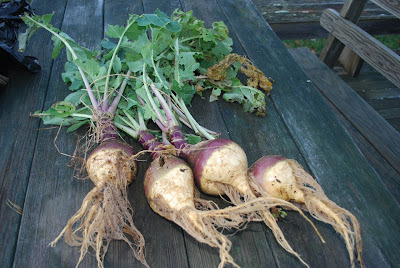 The rutabaga on the other hand have a short span of freshness. That is why they are waxed in the stores. 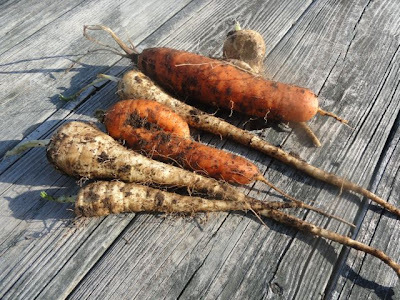 But it is a wonderful seasonal flavor, and I was glad to be able to offer them to the Thanksgiving table again this year. The title here is from one of the lyrics quirks that kids come up with ... like Round John Virgin in Silent Night. It is a child's misinterpreted lyric to a line form God Bless America. But at this time of year it works. 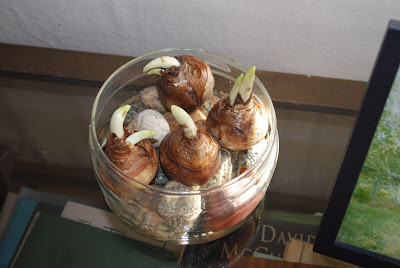 Bulbs bring the festivities indoors and stave off the early darkness of shortened days. Gotta love the paperwhites. They are energetic little bundles and they always surprise me with their perfume. I also put several amaryllis to pot, including two new baby bulbs that came through this season when I went to repot. have to do with this picture? The answer is that these eggshells helped to create a series of heirloom tomatoes this summer (my Italian Sweets to be exact) that did NOT develop blossom end rot (BER). I got this idea from Daphne's blog, but learned it too close to planting time to have collected any eggshells. That is why I am bringing it up now. Once you have a few dozen, wait until a time when you are preheating the oven for some other reason. Lay the shells out on foil or parchment and bake for about 10 minutes at something over 300 degrees. Don't let them burn. The purpose for this is to kill any salmonella. 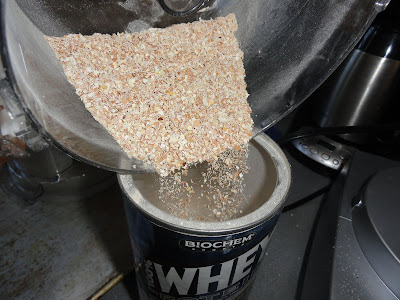 The next step is to place the shells in your food processor and give them a good pulverizing. One word of caution, over time you will dull the inside of your plastic food processing bowl. 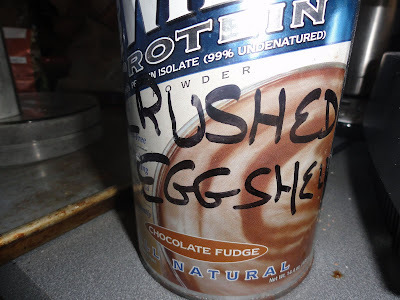 Then I find an old container ... and mark it with a marker CRUSHED EGGSHELLS ... and pour my shells into it. 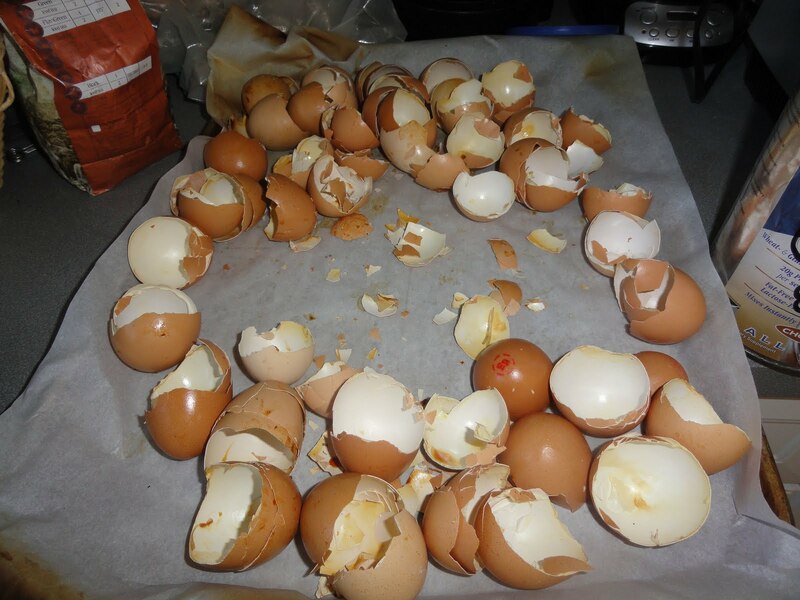 The two of us did not consume enough eggs last year to fully plant out my tomato plants with the recommended one cup amendment of eggshells. But I was sure to use them on those that a prone to BER, and was very pleased with the results.